What responsibility do content marketers have to ensure content is accurate and fact-based? Mainstream publishers, journalists and media companies have long placed high value on fact-checking, accuracy and content integrity. But with the rise of content marketing as a widely accepted marketing practice, more brands are stepping into the role of publisher. Inevitably, some of these brand publishers don’t put the proper time and effort into creating a robust fact-checking process, contributing to the dissemination of misleading, inaccurate or even blatantly false content. Doing your research can be time-consuming and, let’s face it, not very glamorous. So what’s in it for brands (besides the moral responsibility to not intentionally spread misinformation)? A 2016 Gallup poll found that Americans’ trust in mass media sunk to an all-time low of 32 percent. In other words, mass media has a PR problem. Perhaps that’s partly why Oxford Dictionary selected “post-truth” as its 2016 word of the year. A growing percentage of people have little trust in the content they hear on TV and read online. If you’re in the content marketing game, that means it’s up to you to establish authority and credibility to build trust with skeptical consumers. The truth is whether you’re creating data-driven white papers, in-depth infographics, informational blog posts, engaging social media blurbs or any other type of content for your brand, you should incorporate the same meticulous fact-checking process that journalists adhere to. 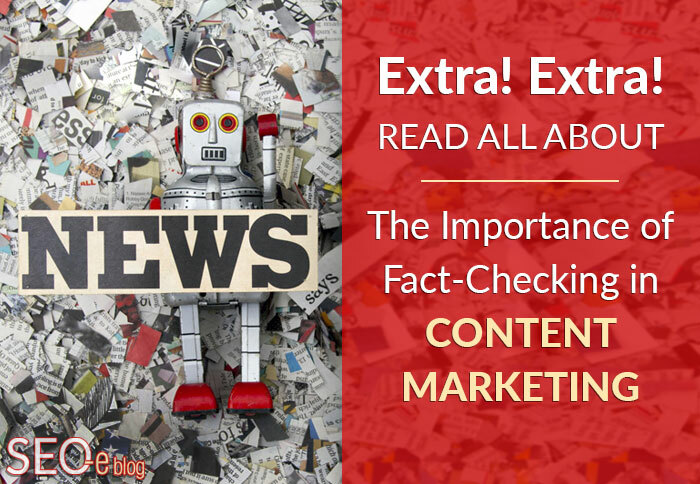 Fact-checking content for accuracy is important regardless of what you’re writing about, but the level of effort it requires can vary by industry. Healthcare, legal, finance, insurance and other strongly regulated industries, for instance, may require a healthy dose of fact-checking in order to make sure the information you provide is accurate and compliant. As an editor of several legal websites, including Enjuris.com, I consider it one of my most important responsibilities to ensure that all the content we publish is as accurate, true, precise and up-to-date as possible. In this industry, not only are there legal ramifications for spreading false information, but failing to fact-check can also potentially cause real emotional and financial harm to our audience. That’s not a risk we’re willing to take, which is why we invest more time and effort into every piece. In the end, we believe this helps establish Enjuris as an industry authority, which ultimately pays off in the end. Fact-checking involves more than just googling something to confirm your data. Spell checkers will pick up on most grammar and spelling errors, but you’ll have to dig a little further to double-check that you’ve got your facts straight. Here are 8 basic components you should double-check in order to think like a journalist and ensure that your content remains credible, accurate and trusted. Duplicate content is a bad idea if your goal is to establish authority. While the consequences of duplicate content are largely over-blown by many marketers (it’s generally not something that will cause you to be delisted from the SERPs), it’s true that Google and other search engines can detect plagiarized or duplicated copy. Like media organizations, the search engines also value accurate and fact-based information for their users, which is why they’ll go to great lengths to return a diverse set of results for their users. If they detect duplicate content, they may try to determine the original article/piece and display it for their searchers. So if your “content strategy” merely involves copy/pasting other articles onto your blog or site with little to no changes, you will likely have a hard time generating long-term rankings and traffic. Original content will always outperform duplicate content. Plagiarism didn’t fly in your English class, nor will it fly in the content marketing world. Continue reading: 7 Ways to Avoid Future Duplicate Content Issues. It’s also important to get brand and company names right. For instance, “Blu-ray” is a company name, so the “b” should be capitalized, and there should be a hyphen when referring to a Blu-ray disk. Failing to use the correct name spelling and punctuation looks unprofessional and hurts your credibility. When referring to statistics, verify all facts, percentages, monetary amounts and other numbers. Also ensure the most up-to-date figures are used. If the writer mentions a time or date—whether they’re referring to a period in history (i.e. World War I, Great Depression, the moon landing, etc.) or an upcoming event—be sure the information is correct by running a quick search or asking co-workers. Not all dates have a catchy rhyme to help remember them (like the day Christopher Columbus “sailed the ocean blue”), so it’s a good idea to confirm these numbers to avoid mistakes. Even if you’re repurposing content from another site, double-check all stats, dates, times and other numbers before publishing it on your site. Verify that all email addresses, phone numbers and other contact information you provide is correct. Confirm that the names of cities (Atlanta), states (Georgia), countries (USA), regions (Southeast) and other geographic locations are correctly spelled. When using quotes, confirm that you have permission to publish the words of the person being quoted. If you’re quoting from another article or report, be sure to link to the original source. Quoting someone without their permission is bad form and can escalate if the misquoted person chooses to pursue legal action against you for defamation. If you do have permission to use a quote, don’t alter the quote so much that it changes its original meaning. If a piece talks about a person in past tense or mentions that they passed away, confirm this fact. Likewise, if an article talks about a person in present tense like they’re still alive, but you suspect this isn’t the case, take a few seconds to look it up. If the copywriter has hyperlinked to a source within the piece, click the link to double-check that they’ve cited the original source and that the link works. Don’t make the mistake of linking to a source… that links to another source… which mentions the original report. This is lazy research and fails to establish true credibility. Also, be sure to pay attention to the date when the original research was published. If the statistics you link to are ten years old, they’re likely outdated and might not be accurate or relevant anymore. Try to find a more recent data set instead. Do Your Part to Stop Misinformation! Whether your content team is in-house or includes freelancers, you can help set an expectation of proven, fact-based copy by adding a step in your content lifecycle that specifies for your team when to fact-check, what constitutes a reliable source (looking at you, Wikipedia), and who will be responsible for making sure that fact-checking is completed before publication. For instance, is it the copywriter’s job to fact-check, or the editor’s? Or both? One actionable step you can take right now is create a checklist to define your own journalistic process. If you already have a brand style guide, be sure to add this checklist in there so that the entire company can reference these standards. Other websites you can trust when it comes to finding reliable sources include “.gov” and “.edu” sites. If you use Wikipedia, consider using it as a launching pad for your research rather than as an original source. The footnotes section at the bottom of most Wiki pages is a great place to start. Do you fact-check your content before publishing? If so, how often?